The replacement covers on this page are for the Plastic FireTech Cabinets. 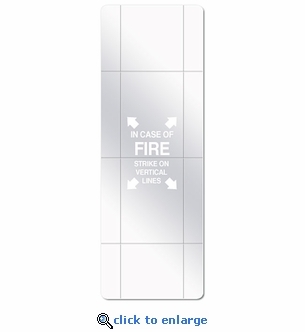 Click Here for Replacement Panels for Metal FireTech Extinguisher Cabinets. For Models: Economyline, Decorline & Classic Series Metal Extinguisher Cabinets. These clear poly "glass" scored break front replacement panels fit the FireTech™ surface mount plastic fire extinguisher cabinets. Each panel is scored for clean breakage in an emergency and is silkscreened with instructions. Select size from dropdown above. FT55 - Fits FT5P - 5 lb. Fire Extingusiher Cabinet - $14.75. ea. Panel Dimensions: 18-3/4" x 7-5/8"
FT510 - Fits FT10P - 10 lb. Fire Extingusiher Cabinet - $17.75 ea. Panel Dimensions: 22-5/8" x 8-5/8"
FT520 - Fits FT20P - 20 lb. Fire Extingusiher Cabinet - $21.75 ea. Panel Dimensions: 27-3/4" x 10-5/8"